You can’t trust a wizard; a person who can summon fire from their fingers or make things disappear has too much power. And you should never bet against a wizard in a gladiatorial arena, who knows what they’ll do. In Cheaty Mages that’s exactly what’s going on as you play a mage trying to throw the fight in your favour. Cheaty Mages seemed to pass under the radar at Essen but AEG have brought this Japanese game to the west and it is deviously good fun. As line-up of fantastical combatants enters the arena, each player makes their bets on who will win. You then try and change the results of the fight by throwing all kinds of crazy spells into the ring. Too many spells and you might just get the attention of the referee and get a fighter disqualified or you can just change the ref. Plaid Hat games makers of the Bioshock board game and Mice and Mystics have announced a new game Dead of Winter: A Crossroads game. Don’t be worried, this game isn’t set around the terrible 80’s UK soap opera Crossroads. No, this game has players attempting to survive an apocalyptic winter, which sounds more fun than the aforementioned soap opera. 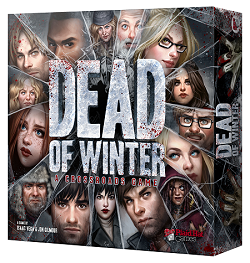 The first game in an on-going series, Dead of Winter has players working together to help the group survive. However, players also have their own secret goal. These goals could be at odds with the group’s objectives, so players often have to balance their own goals against the group’s. You can pre-order Dead of Winter from the Plaid Hat Store. 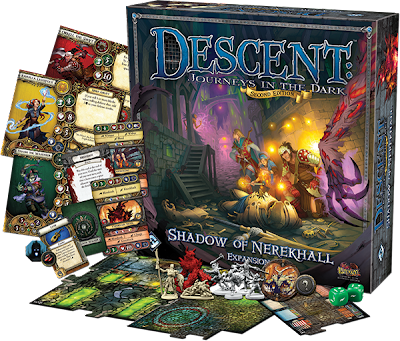 The Descent development team must be working 24-7 as Fantasy Flight Games have announced yet another expansion for the dungeon crawling board game; Shadow of Nerekhall. In this expansion Descent moves into the city of Nerekhall with 19 quests that can be played stand alone or as a continuous campaign. Not only do we get the usual inclusions of new monsters, new characters and new items we also get new character classes for each archetype as well as a few new tricks for the Overlord. Nerekhall is a corrupt place and now the Overlord can use influence to corrupt the city guards and even the heroes. If you’re a Descent player you now have a huge arsenal of options at your disposal. If you haven’t played Descent then don’t forget to check out the Descent review. Most people agree that the living card game format is a great thing. No need to worry about whether your random booster pack contains nothing but gumpth and no paying stupid amounts on eBay for that rare killer card. However, it leaves one slight flaw when it comes to the tournament scene, you can’t play draft games. Draft games are where upon entering a tournament you are given a number of sealed booster packs. You then have to build your tournament winning deck from the random cards in the boosters. 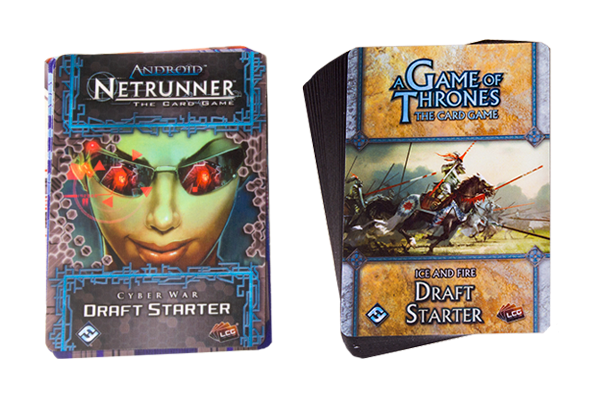 The LCG format currently doesn’t have a way of playing this way so Fantasy Flight Games have announced the release of LCG Draft Packs for both Netrunner and A Game of Thrones. A starter pack and then a randomised draft pack give you the cards need to play and together with Fantasy Flight’s special algorithm you can be sure you have a random yet balanced pack of cards at your disposal.